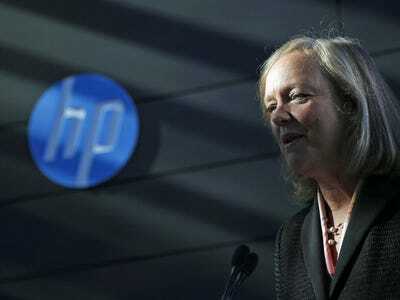 HP has laid off 41,000 people (with about 9,000 people left to go) under its current downsizing plan for 2014. On Tuesday, the company hinted that more layoffs could be coming with its plans to separate itself into two huge companies. During its quarterly conference call, Wall Street analysts asked for details about HP’s plans to divide itself into two companies: HP Inc., which will be the PC and printer unit, and HP Enterprise, which will be all the other businesses like servers, networking gear, software, outsourcing, cloud computing and so on. Maynard Um of Wells Fargo delicately asked CEO Meg Whitman if these plans will involve any “incremental synergies” which is code for more layoffs, though it also implies getting rid of other things like equipment, real estate. Whitman didn’t answer the question directly but hinted that this was likely. Whitman asked CFO Cathie Lesjak to respond to the question, too. Many HP employees probably won’t be surprised if HP does trim its workforce some more when it splits. They have been going through layoffs since 2008. The latest round, which began in 2012 as a plan to trim 27,000 employees, was expanded to 29,000, then to 34,000, and then, in May, to 45,000 to 50,000. And HP is still enormous. Over 275,000 people work there. Again, Lesjak said that out of the 50,000 employees it was cutting in the current layoff, 41,000 are now gone. The layoff cost HP $US1.6 billion in its fiscal 2014, and it expects to save $US3.5 billion dollars when the layoffs are complete, applying some of that savings to R&D and product development hoping to get HP to grow revenues again.